The Basmala (Arabic: بسملة‎ ) is the name of the Islamic phrase b-ismi-llāhi r-raḥmāni r-raḥīm بِسْمِ اللهِ الرَّحْمٰنِ الرَّحِيْمِ which means “In the name of God, the Most Gracious, the Most Merciful”. This Islamic phrase appears as opening for every chapter, except one, in the Holy Quran, which Muslims accept as Divine book of guidance and wisdom and having been sent as prophetic revelation to entire humanity culminating the messages sent through earlier chain of prophets including those in Abrahamic religions. The Divine is described by a set of 99 names and the basmala selectively adopts two names which means the Most Gracious and the Most Merciful. The fact that these two names appear in the Basmala, that repeats as opening for every chapter in the Holy Quran which is regarded as book of wisdom and guidance, it then implies that the path to wisdom and guidance lies in grace and mercy. Muslims also recite Basmala, as recommended in Islam, in order to begin any action. There too the message that every action has to be with grace and mercy is clear. 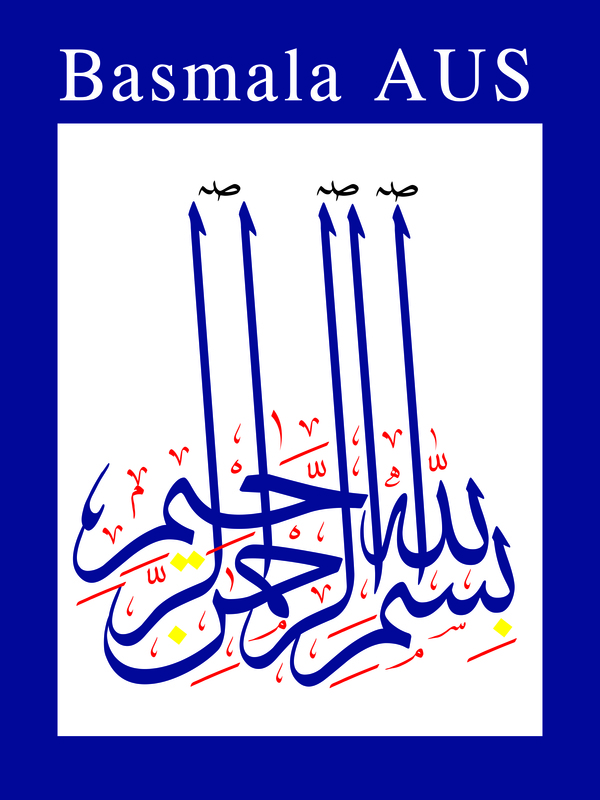 The above logo, is an arabic calligraphy, that spells out the basmala in full. It includes the colours of Australian flag and the Aboriginal flag. Even though the arrival of South East Asians to Australia dates back to 1600s or possibly earlier, the contemporary South East Asian community is a young and recent one. The above logo symbolises our message that as we commence our journey as Australians, we wish to do it with grace and mercy and through the embrace of this nation and traditional owners.